The high peak powers available in ultrafast pulses have opened new avenues of exploration in intense light-matter interactions. Further, with rapid improvements in the quality, ease-of-use and affordability of ultrafast tools to non-physicists, the time is ripe for their use in diverse fields. With creative, interdisciplinary science written into its foundational principles, OIST offers an ideal venue to pursue innovative ideas in collaboration with colleagues in disparate fields . In collaboration with the Neurobiology Research Unit at OIST, we learned to stimulate liposome nanostructures with femtosecond pulses, causing the controlled, repeated release of neurochemicals that could directly influence brain functioning in mice. Beyond the first experiments, we have shown the ability to interface with neural functioning in a live mouse brain slice by evoking sub- and supra-threshold changes in membrane potential via the on-demand, rapid release of the excitatory or inhibitory neurochemicals with femtosecond pulses. Our work provides a new tool in neuroscience research and further treatment of neurological disorders. In a collaboration with art conservators at OIST and Buffalo State College, we demonstrated the ability to take minute cross-sections of art work with minimal to no damage to the surrounding paint. Such cross-sections – essential to furthering an understanding of the artwork’s history, authenticity, and preservation, were previously taken using scalpels, which can cause further flaking and damage to fragile paintings. 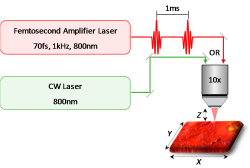 In contrast, with high peak powers and short pulse durations that minimize heat transfer, we showed that femtosecond laser pulses ablated a wide variety of art material with micrometer scale precision. Our work is among the first demonstrations of the utility of femtosecond light in art conservation, and the first in the context of cross-section preparation. With the Information Processing Biology Unit we forayed into optical microscopy and optogenetics. The activity of neurons can be stimulated by light using transgenically expressed channelrhodopsins. We investigated the properties of activation of these light-sensitive ion channels. Our results show that channelrhodopsins can be efficiently stimulated in this regime, thus allowing us to manipulate sensory neurons in the absence of chemical stimuli. Ca2+ sensitive GCaMPs can be used to measure the resulting neuronal activity. We learned that 1-photon excitation/emission spec­tra for these two groups overlap significantly, thus com­plicating simultaneous stimulation and readout of neu­ronal activity. To solve this challenge, we are implementing a volumetric 2-photon excitation (TPE) microscope using wide-field temporal focusing. This allows us to obtain high speed, volumetric scans of neuronal activity in optogenetically manipulated C. elegans to better understand the integration of sensory stimuli and resulting behavioral plasticity. Below, we list our recent publications from interdisciplinary collaborations within OIST. Recently, ultrafast lasers exhibiting high peak powers and extremely short pulse durations have created a new paradigm in materials processing. The precision and minimal thermal damage provided by ultrafast lasers in the machining of metals and dielectrics also suggests a novel application in obtaining precise cross-sections of fragile, combustible paint layers in artwork and cultural heritage property. Cross-sections of paint and other decorative layers on artwork provide critical information into its history and authenticity. However, the current methodology which uses a scalpel to obtain a cross-section can cause further damage, including crumbling, delamination, and paint compression. Here, we demonstrate the ability to make controlled cross-sections of paint layers with a femtosecond pulsed laser, with minimal damage to the surrounding artwork. The femtosecond laser cutting overcomes challenges such as fragile paint disintegrating under scalpel pressure, or oxidation by the continuous-wave (CW) laser. Variations in laser power and translational speed of the laser while cutting exhibit different benefits for cross-section sampling. The use of femtosecond lasers in studying artwork also presents new possibilities in analyzing, sampling, and cleaning of artwork with minimal destructive effects. Schematic illustration of the laser cut processing of paints. External control over rapid and precise release of chemicals in the brain potentially provides a powerful interface with neural activity. Optical manipulation techniques, such as optogenetics and caged compounds, enable remote control of neural activity and behavior with fine spatiotemporal resolution. However, these methods are limited to chemicals that are naturally present in the brain or chemically suitable for caging. 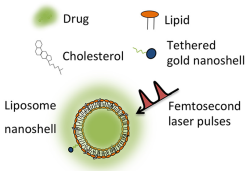 Here, we demonstrate the ability to interface with neural functioning via a wide range of neurochemicals released by stimulating loaded liposomal nanostructures with femtosecond lasers. Using a commercial two-photon microscope, we released inhibitory or excitatory neurochemicals to evoke subthreshold and suprathreshold changes in membrane potential in a live mouse brain slice. The responses were repeatable and could be controlled by adjusting laser stimulation characteristics. We also demonstrate the release of a wider range of chemicals—which previously were impossible to release by optogenetics or uncaging—including synthetic analogs of naturally occurring neurochemicals. In particular, we demonstrate the release of a synthetic receptor-specific agonist that exerts physiological effects on long term synaptic plasticity. Further, we show that the loaded liposomal nanostructures remain functional for weeks in a live mouse. In conclusion, we demonstrate new techniques capable of interfacing with live neurons, and extendable to in vivo applications. 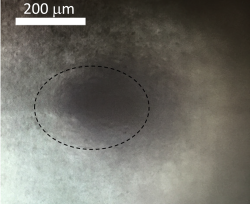 Image of injected liposome in brain slice with the presence of gold nanoparticles (within dotted line). Sci. Rep. 4, 5398 (2014). Existing nanoscale chemical delivery systems target diseased cells over long, sustained periods of time, typically through one-time, destructive triggering. Future directions lie in the development of fast and robust techniques capable of reproducing the pulsatile chemical activity of living organisms, thereby allowing us to mimic biofunctionality. Here, we demonstrate that by applying programmed femtosecond laser pulses to robust, nanoscale liposome structures containing dopamine, we achieve sub-second, controlled release of dopamine – a key neurotransmitter of the central nervous system – thereby replicating its release profile in the brain. The fast delivery system provides a powerful new interface with neural circuits, and to the larger range of biological functions that operate on this short timescale. Liposome delivery system with dopamine release being triggered by femtosecond pulses. K. M. Dani, Commentary: Pursuing science across nationalities and disciplines, Phys. Today, 70, 10, (2017). Page last updated on October 20, 2017 (CP/KMD/VL).